We're in chapter 6 for Math in Focus, which is fractions. I don't think it matters what math program you use, fractions is always an important chapter in fourth grade. I love it and I hate it. I love it because it's visual. I hate it because so much of it is counter-intuitive (1/2 plus 1/2 equals...not 2/4, gah!). So lots of kids get lured into a false sense of security. 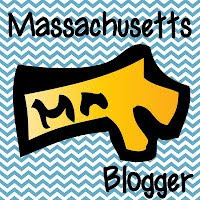 That's why I'm linking up with some fellow New England teachers to clear up this common math misconception! Sure enough, on the day of the pretest (really a check up of what they remember from third grade, not a pretest of what is to come in fourth) a large portion of my class said, just before taking the pretest, "Oh yay! 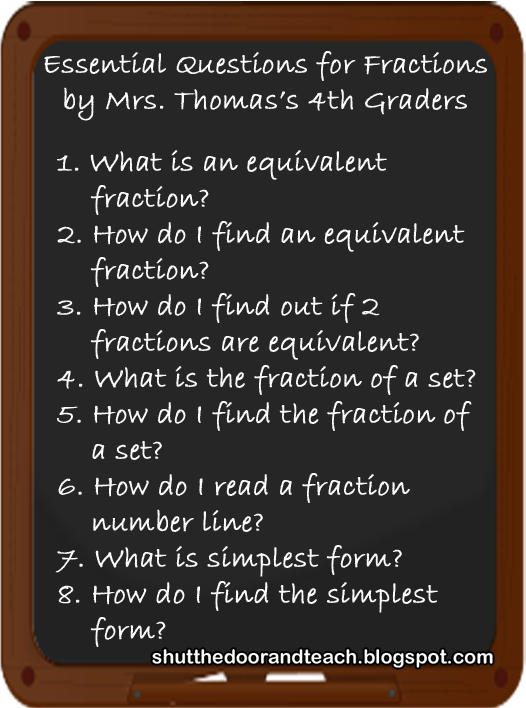 Fractions!" And then as they were taking it, the hands started going up. "What does equivalent mean?" "What does express mean?" "I don't even know what fraction of a set means. Is my answer going to be a fraction?" I wrote down the questions they had on the board and let them know we'd be answering all of them over the next several weeks. 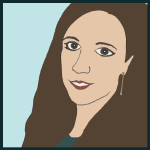 Meanwhile, just as I started digging through the extra practice from third grade, picking and choosing what to hone in on during school hours, I happened to start reading more teacher blogs in the evenings. And coincidentally, one of my co-collaborators over at ATUE, Meg over at Fourth Grade Studio has been working on fractions for the past week or so, and her blog is AMAZING. Some of it is stuff I've done in the past, and will continue to do, like paper folding. But she doesn't just stop there. Every lesson is so purposeful in where she wants students to end up, yet she encourages the kids to do their own exploration, gives them room to make mistakes, and guides them toward self correcting their own misconceptions. Talk about the "guide on the side, not sage on the stage." Plus I'm learning new things, like I'd have never thought about having a debate about 2/4 like in this post. So with this challenge in mind, I planned my week. 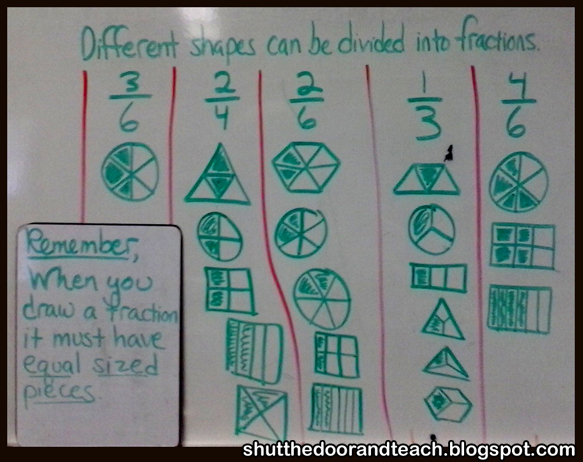 First I challenged my class to draw several fractions. Most of them were able to accurately draw some fractions, since we do "Calendar Math" fractions every day. And yet, surprise, surprise. They all drew the exact same shape: circles. Not one of my students had the fluidity of thought to extend what they knew beyond circles. EEK! I knew that some paper folding with rectangles was just what they needed. I warmed them up a little after drawing all their circle fractions by asking, "who thinks they can show 2/4 with a rectangle," and so on, and most of them could do it. Some had very creative ideas with prompting. But they clearly needed practice to be really comfortable with other ways of representing fractions besides the circles they were used to seeing. At this point I wanted them to explore like Meg's students did. I wanted to give them room to make mistakes that they could learn from, but within a framework. I paid close attention to Meg's definition of fractions as having equal sized pieces, not equal shaped pieces, which I emphasized to my class. I decided that for our paper folding exploratory activity, I wanted to stick with 1/2. Why? Because Math in Focus focuses on a half as a "benchmark fraction." One way the kids are encouraged to figure out which fraction is greater is to tell if it's greater than a half first. Then, if the other fraction is less than a half, they know the answer without having to find common denominators. So I figured the more practice they get with fractions that are equivalent to 1/2, the better. I started out by asking them to fold the rectangle in half, and each half had to be exactly the same shape. As expected, some folded it vertically, some horizontally, and some diagonally. What I didn't expect was that last one on the top right in the photo! One of my hyperactive, tough to get his ideas down on paper sort of kids has a real knack for seeing how things work (a free thinker instead of a logical thinker) had the idea of making opposite corners meet. I could not dispute that it was exactly in half when he showed me how he did it! Check out the top right. Divergent thinker! The next steps were to trace the fold so it was more visible, and finally, color one half. Once each kid had at least one made, I asked those with more than one to stick one up on the board. After we critiqued each one, I told them I wanted them to fold their other half colored rectangle more times, but the catch is, when they open it up, all the pieces should be the same size. I did 2/4 to demonstrate, and I told them they could copy me for the first one, but after that, experiment. "If you open it up and feel like it's wrong, leave it on the floor in front of you, get a new one from one of the piles near you (I had them scattered around) and try a different way. This is your chance to test out your ideas!" 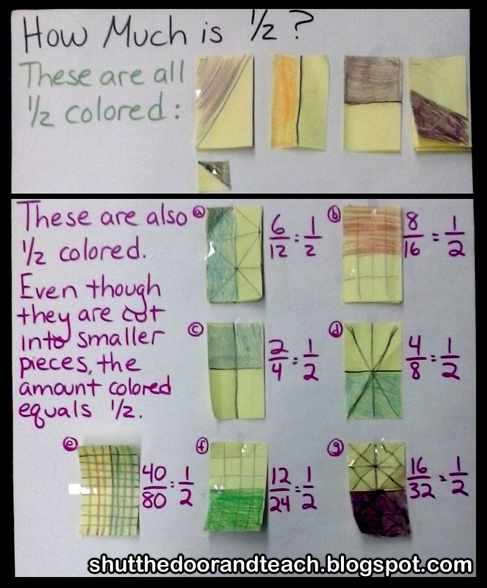 I put them all on the board, and I chose a couple of the accurate models to talk about the fact that they all still had just 1/2 colored, but the number of pieces changed (This poster came later, after all the fractions had been critiqued). 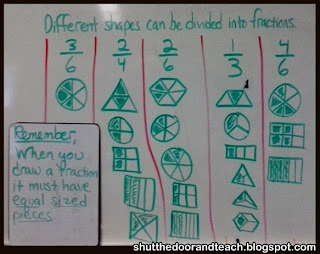 I told them tomorrow they'd "defend" why they thought their fraction was correct by focusing on the size of the pieces. Then we had a blizzard that cancelled school for a couple days. But after that, we were on our way again, hah. In the meantime, the kids' homework was to draw 1/2 five different ways. They were able to draw it using lots more shapes than they did before this lesson, and everyone who followed the directions knew how to draw the sections in equal sizes (a couple kids misread the directions and drew a bunch of 1/5s and could fix it on their own once I asked them to reread the directions). Only 2 kids started to make the connection between today's lesson and what is coming next, which is equivalent fractions. Those two kids drew shapes with 2/4, 5/10, 4/8, and so on. Those two kids internalized the lesson after one day; the rest would need another look after our debate. But not to worry: we haven't even TOUCHED the algorithm for the denominator being twice the numerator yet. My dream is for every kid to "discover" that on their own...we'll see how many I can get there before spilling the beans! Thanks for hosting! Meg changed the way I think about teaching fractions so I was already singing her praises, haha.